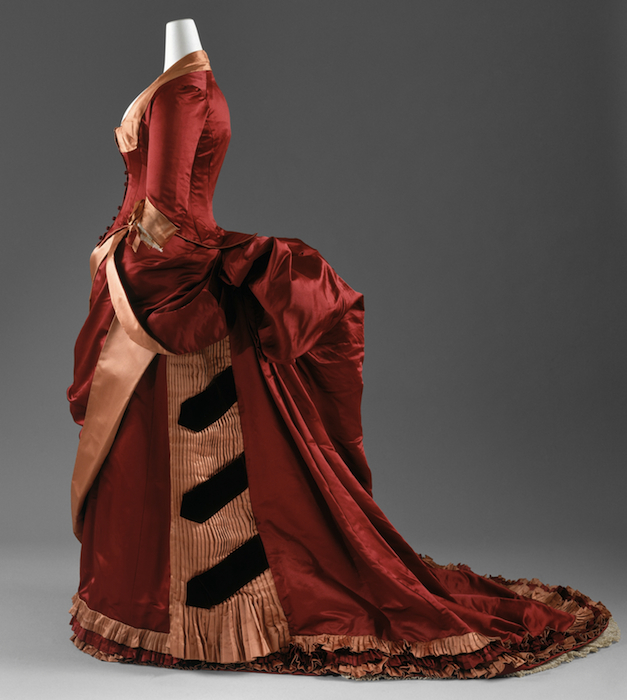 According to The Metropolitan Museum of Art, which is the source of the 1884-1886 evening dress shown above, “The bustle was at its greatest extension by 1885.” No kidding. The back of this dress, with its ginormous, protruding posterior, is almost horizontal, in contrast to the rounded silhouettes of the Hoop Era that had come before. “It was a popular conceit that the cantilevers of these bustles could support an entire tea service,” an uncredited author at the Met remarks. From here, it looks like you could land a Grumman F-14 Tomcat on the back of that thing. By 1887, though, the bountiful bustle had flattened out somewhat, as seen in the rehearsal snapshot below of actress Kristin Brownstone, who is playing the part of Mrs. Kendal in the City Lights Theater Company’s production of “The Elephant Man,” through April 17, 2016. Over the past few months, I have learned more than I ever thought I would about this particular piece of women’s clothing from the late Victorian Era because my wife, Pat Tyler, made this costume for City Lights from scratch. Since her sewing room doubles as our living room, I got to watch it take shape. 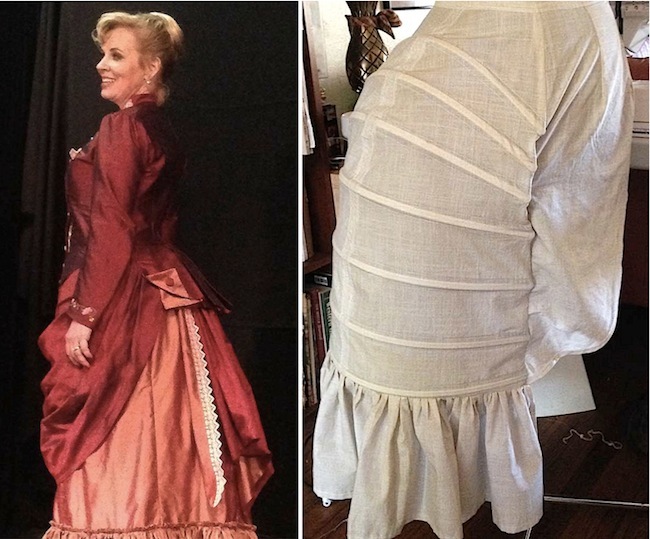 Left: Kristin Brownstone as Mrs. Kendal in a costume by Pat Tyler for “The Elephant Man.” Right: The bustle itself, from a pattern by Truly Victorian. That gives the dress its shape, but because each piece of boning is parallel to the next, with nothing but cotton in between, the dress allows the wearer more mobility than you might think. In particular, it makes it relatively easy to sit down, as the short video below shows. This is something I’d always wondered about, but then again, conversations about such things are common in our living room. “ ” “Marginalia helps us recognize that medieval society was as complex as our own.